Just in time for the peak of salmon season, we bring a little help to those unfamiliar with setting up a kwikfish (or flatfish, essentially the same, with a little different action) with a wrap. An extremely effective salmon lure ... for both spring and fall fish in Washington and throughout our Alaska summer fishery ... this is one of the staple rigs of most guides. You can follow the instructions and photos below to learn how to wrap the plug, or if you wish, you can download a video of Bob wrapping a plug by clicking here and visiting our videos section. 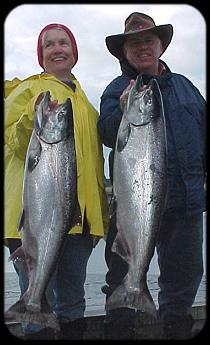 Sardine-wrapped kwikfish accounted for this pair of Kasilof River, Alaska king salmon. Your first step is to take a fillet off the side of the sardine as we are doing in this picture. The process is simple, make a cut behind the gill plate, rotate the knife towards the tail and cut along the backbone. Your next step is to trim the fillet. Ideally, we like the fillet about 3/4 of the plugs width and about 1/2 the length of the plug. Keep the edges as neat as possible and try to keep a consistent thickness to the finished fillet by trimming more from one side or another. Do keep in mind that not only does this wrap add scent to the plug, it also slows down the wobble a little ... a characteristic that the salmon (especially kings) seem to prefer. So a little tiny wrap isn't going to do you a lot of good! Your next step is to split the trimmed fillet down the middle for about 3/4 of the length of the fillet. If you trimmed neatly, the mid-point will often be distinguished by a dark line in the fillet, but this line is not always the true center line of the fillet, so pay attention. Your finished trimmed fillet will look like this ... now comes the next step, actually wrapping the fillet onto the plug. 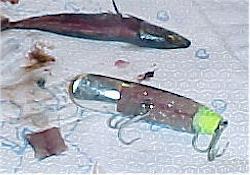 Place the fillet onto the belly of the plug by sliding the slit down over the belly hook eye. You want the fillet to be just about centered, or perhaps a little toward the tail end along the length of the plug before you begin. To attach the fillet to the plug, we like to use a product called Magic Thread ... although some people use rubber bands, transparent thread, or light mono. Simply start wrapping the thread around the plug while you hold the fillet in place. We think it is easier to start from the end which was split (the tail of the plug in this case), but do whatever you feel comfortable with. Make sure to keep the treble hook away from the end of the plug that you are wrapping so that you don't catch the thread on the hook. Continue wrapping forward ... we place about twenty wraps around the fillet on my plug, but seen others use less with success. 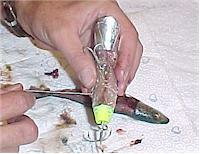 As you pass the belly eye to which the front hook is attached, flip the hook back toward the tail and continue wrapping forward until the entire fillet has been securely attached to the plug. When you finish wrapping forward, wrap back toward the tail again (wraps not so tightly spaced this time) and throw in a few half-hitches and pull snugly ... this is where Magic Thread works so well ... you can simply break it off in most instances, or trim whatever tag end you have with a knife. There you have it ... the finished wrap. Remember, you can download a video of the process by clicking here. One final step before you run this setup out in front of waiting fish: you need to tune the plug. Place the lure in the water and make sure that it swims in a straight line. If it veers one direction or another, ever so slightly twist the screw eye (clockwise to make the lure swim more to the left and vice-versa) to which the plug snap is attached until the plug swims in one spot without veering to one side or another. This is a CRITICAL step and don't ever skip it! Run 'em out and wait for that big take-down!